If you have ever experienced issues with receding gums, then you know that it can be quite a serious problem which causes not only pain, but also the incidence of gaps, or pockets, between the gum line and teeth, which are a perfect place for the accumulation of dangerous bacteria. WebMD reports that receding gums can further on cause severe damage to the supporting tissue and bone structure of the teeth, and eventually, a tooth loss. According to a study published in the Journal of Periodontology Online suggested that one of the reason for the gums to begin receding is being a little too zealous with the routine of cleaning the teeth. Another reason for the teeth to start receding is genetics. Namely, WebMD claims that 30% of the population has a predisposition to gum disease. This means that if you belong to this group, you are more likely to suffer from a gum disease, regardless of the way you treat your teeth. Smoking is another cause of receding gums. Simple Steps Dental claims that this habit is one of the strongest influences in the development of various gum issues, such as receding gums. Fortunately, there are some natural ways to struggle with this problem. However, note that they will be effective as long as you start using them in the initial stages of the disease, not too late when the only solution is surgery. Then, you will need to cure the issue with gum tissue grafts and other expensive methods. Vitamin C has been used in numerous natural treatments of bleeding gums, swelling or recession for centuries. One study which has lasted for 14 weeks, conducted at the University of California San Francisco, discovered that the increased dosages of vitamin C led to the reduction of the symptoms of bleeding gums, and vice versa. 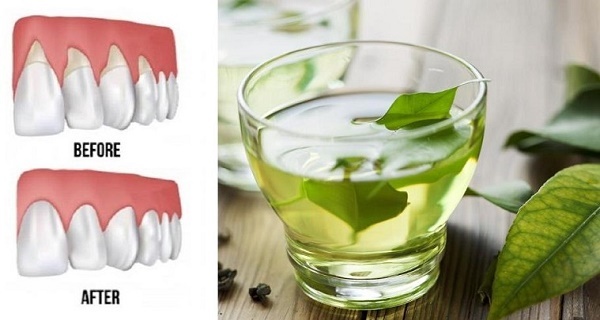 The American Dental Association published a Japanese study which discovered that the regular consumption of green tea has beneficial effects on the health of the gums and teeth. Namely, participants drank green tea on a regular basis, and researchers found that it reduced three indicators of periodontal disease, bleeding, periodontal pocket depth, and attachment loss of gum tissue. According to WholeHealthMD, eucalyptus is a substance with potent anti-inflammatory properties which effectively cure the gum disease. Eucalyptus also has high germ-fighting abilities and destroys bacteria in the oral cavity in the case of gum recession. You should also do some measures to enhance your overall oral health.